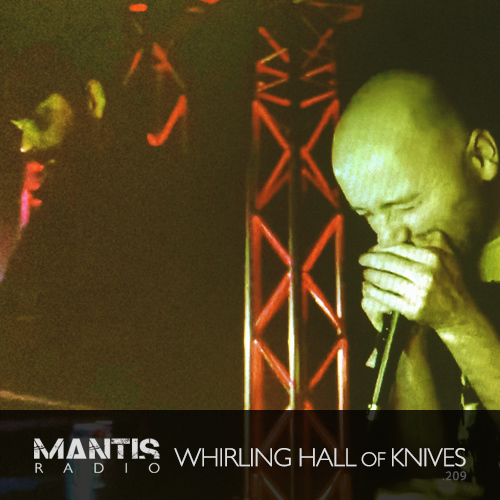 Whirling Hall of Knives supply an incredible exclusive live session of their scorching techno and noise eruptions. We’ve new and old from Suicide, Autechre, Machinecode, Vacated, In Darkness There is Light, DVA Damas, SPK, Orphx, Ø, Special Request and many more. Coming up tonight the collaborative machine flex of Magnetize and The Last Sound as Whirling Hall Of Knives with an exclusive live session. Performing since the mid 2000s, the pair have a sizeable discography of aural abuse behind them. Their most recent offering being the excellent LP Seacht (available on their own WHOK imprint). Their session builds, screams, rolls and smashes. Also of note is EP Arc Molt, released back in Feb on Candela Rising, featuring a remix from Downwards signed Talker (Johnathan Krohn aka Stave + Karl Meier). harsh smouldering circuits and eruptions of panicky white noise have a profoundly unsettling quality, a sense of gnawing paranoia but interspersed with moments of almost euphoric epiphany, as if in the grip of an unshakeable 4am psychosis a growing sense that the door will be kicked in at any second and the world outside will come pouring in. Psyche electronics of a particularly greasy and grime-flecked hue.